The program started in the late 1960s and has dominated NASA's manned operations since the mid-1970s. According to the Vision for Space Exploration, use of the space shuttle was to be focused on completing assembly of the ISS by 2010, after which it will be retired. NASA planned to replace the shuttle with the Orion spacecraft, but budget cuts have placed full development of the Orion craft in doubt. The SPACE SHUTTLE 30th ANNIVERSARY PIN (Official NASA Edition) is a commemorative pin that includes metal flown on a Space Shuttle mission - This flown metal information is included on the reverse side of this historic pins. This Lapel Pin in a high quality enamel pin that measures approx. 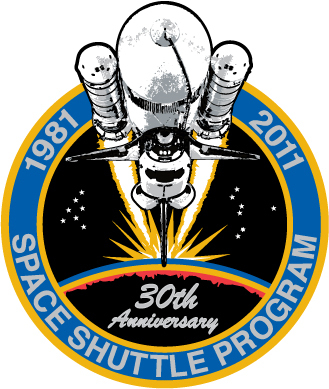 3/4"
The shuttle is the only winged manned spacecraft to achieve orbit and land, and the only reusable space vehicle that has ever made multiple flights into orbit. Its missions involve carrying large payloads to various orbits (including segments to be added to the International Space Station), providing crew rotation for the International Space Station, and performing service missions. The orbiter has also recovered satellites and other payloads from orbit and return them to Earth, but its use in this capacity was rare. However, the shuttle has previously been used to return large payloads from the ISS to Earth, as the Russian Soyuz spacecraft has limited capacity for return payloads. Each vehicle was designed with a projected lifespan of 100 launches, or 10 years' operational life.